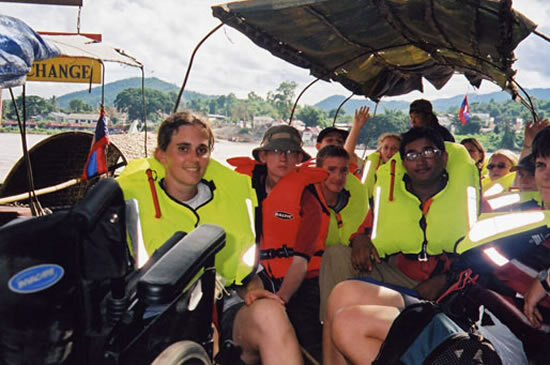 JoLt 2002 – Indochina « Jolt Trust – Expanding horizons, enriching young lives. Where do you start to describe the Journey of a Lifetime to Indochina? With the nervous individuals who gathered at Heathrow airport on July 12th 2002, many of whom had never flown on a plane or left their homes for more than a few days? 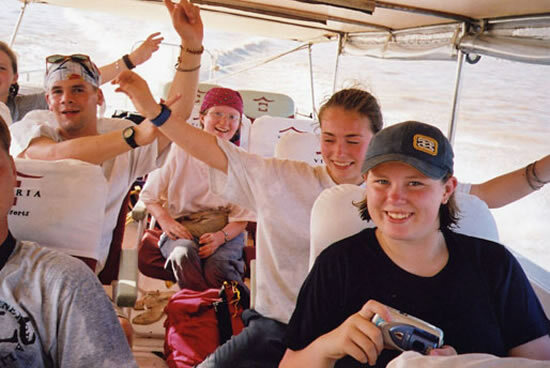 Or with the smiling, confident group that arrived back four weeks later with tales of places seen, challenges overcome and life-long friends who shared the experiences? 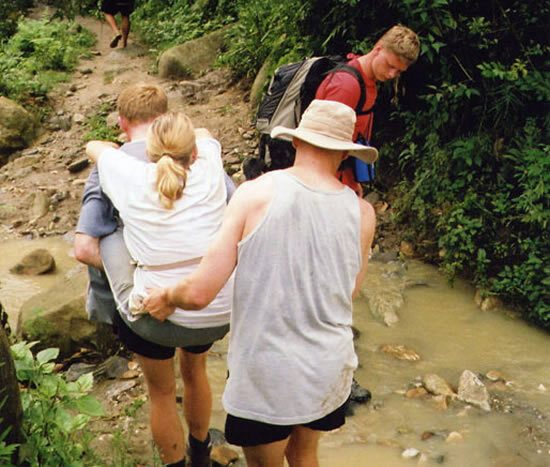 The journey was a challenge both physically and emotionally – learning how to dig deep into hidden reserves when both body and mind want to stop, realising that in order to achieve the very best everyone has to work together regardless of their own weaknesses, and the feeling of achievement when the challenge has been met. 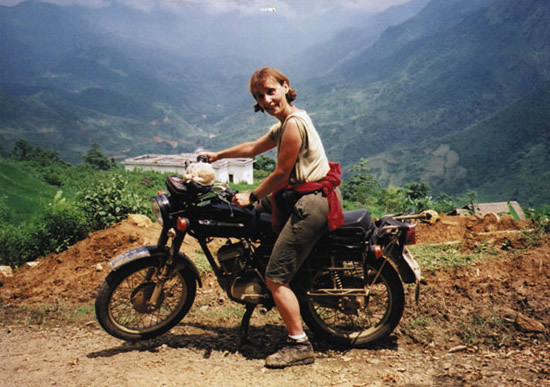 Possibly one of the greatest achievements was high in the mountain region of Northern Vietnam, about half way through the expedition. 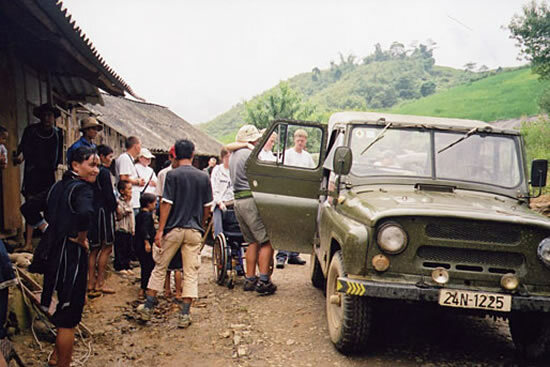 The group had arrived late the night before after a 15-hour bus journey from Hanoi and set off early into the mountains, first in a convoy of Russian jeeps and then walking. July is monsoon season and the path, usually passable by jeeps, had been repeatedly battered by the torrential rains of the previous weeks. 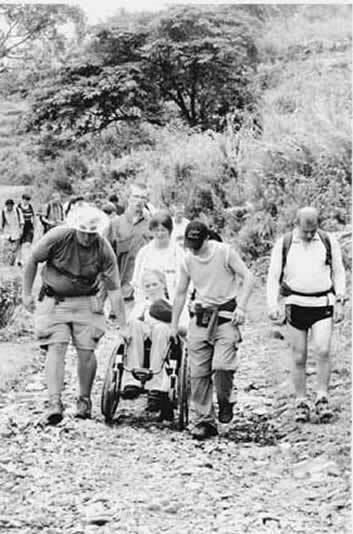 The walk, which would usually take two hours, became a challenge to the whole team – lifting wheelchairs across gullies and holes, climbing over large boulders which had slipped from the edge of the road, wading through muddy puddles of varying depths and surviving the sticky heat which, even in the mountains, sapped every ounce of energy. It took six long hours to negotiate the path to the village and during that time the sense of achievement grew and grew – no one was spared a moment of feeling that they couldn’t go on and yet the whole team made it to the bottom of the valley. Along the way there were many stunning views of the mountains and paddy fields and refreshing waterfalls to stop and cool off in. At the bottom of the valley there was one final challenge – to negotiate through the paddy fields, along narrow mud walls between the rice, up to the house of one of the hill tribes. A final burst of energy and strength was required to help each other before a very well earned rest. 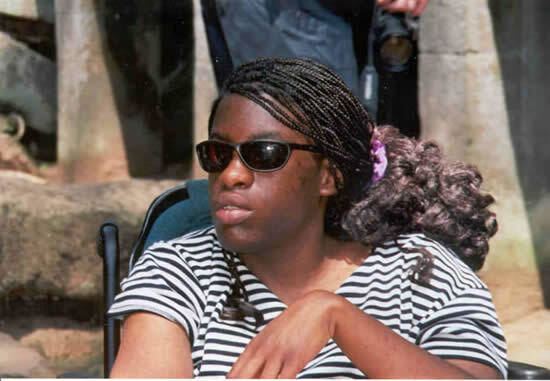 The journey was an opportunity for a group of young adults from very diverse backgrounds to discover more about themselves and, along the way, to develop self-confidence and undertake challenges many would not have thought they were capable of. Nine months previously teachers, parents, social workers or friends had nominated these youngsters for the expedition. They had been selected from a large number as being those who would gain the most from a Journey of a Lifetime. The journey started in Bangkok where the heat and humidity were the first challenge for most. The first of many long bus journeys and border crossings took the group into Cambodia where, even before the first destination had been reached, the challenges started. A broken bridge meant unloading the bus, crossing by foot and then reloading. Bags, wheelchairs and individuals all had to be counted on and off in pitch darkness and by the time the group reach Siem Reap and unloaded for the first night under mosquito nets a sense of team work had already begun to develop. 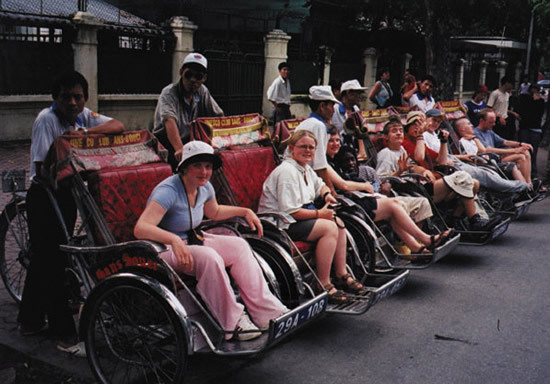 Cambodia was the country of varied transport – elephants around the magnificent temple complex of Angkor Wat, a helicopter ride over the temples and Tonle Sap lake, a bumpy boat ride across the lake and go-karting in Phnom Phen. In Phnom Phen the group was hosted by a French charity, ‘Pour sourir des enfants’ which supports children living on the city rubbish dump. The reception when the group arrived late, dusty and tired was incredible, a mass of singing smiling faces. The children organised a cultural show and party for us which was a wonderful opportunity to share stories and songs. In sharp contrast to the fantastic welcome there was a very sobering 4am trip to the rubbish dump to see the work being done by the charity and help with breakfast, followed by a visit to the Khmer Rouge genocide museum where the local guide shared his personal experiences of living in Cambodia during that time. 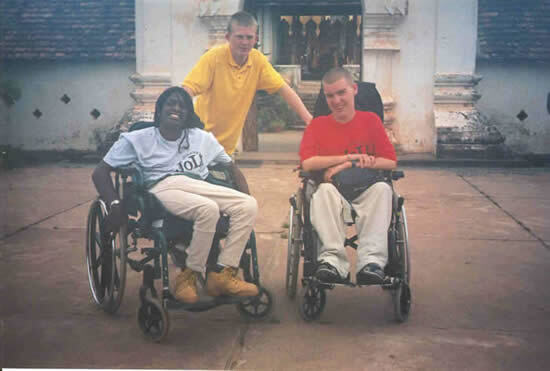 Then a cultural event at the other end of the spectrum – a reception held by the British Embassy for us – followed by a visit to a rehabilitation centre for amputees where the JoLt team was thoroughly beaten in a wheelchair basketball challenge. From Phnom Phen a speedboat ride took the group across the border into Vietnam and to a luxury hotel for a night. This was a sharp contrast from the previous few nights, and the opportunity for many to reflect on their lifestyles and comparative luxury back home, despite their own situations. Often the biggest challenges came from the most unexpected sources: surviving without running water, showers, European-style toilets or electricity were initially tough. Early mornings were, for some, the hardest challenge – a 5am start was common – but once it was appreciated how much more could be achieved, there were fewer grumbles. Ho Chi Minh City was the starting point for three days on the Reunification Express to northern Vietnam. The train provided the opportunity for many to catch up with writing home, playing games of scrabble and cards and getting to know one another better. Hoi An, a world heritage site, is also the home to some of the best tailors in Vietnam and many took the opportunity to have clothes specially made. The transformation from dusty travellers to beautiful silk-clad individuals was for many a huge confidence boost. A further train journey found the group in Hanoi – a strange mix of western style buildings and fascinating old streets filled with local people in traditional attire which was explored as a whole group by Cyclo. A reception hosted by the British Council was an opportunity to meet local disabled teenagers and resulted in the now well-practiced JoLt ‘choir’ performing a variety of songs. The event made the national television news and several of the group were interviewed. Following this was a visit to a water puppet show, possibly one of the strangest theatrical events ever seen. 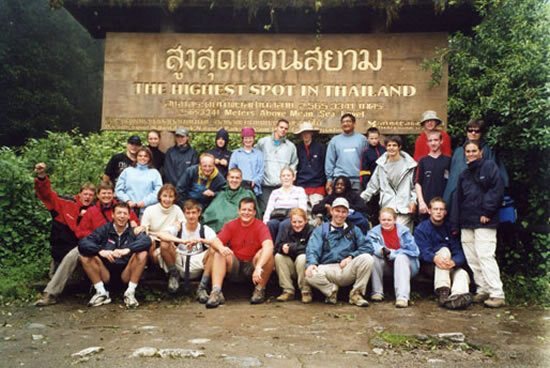 Following the trip to the mountains the group flew to the neighbouring country of Laos. In the capital Vientiane they were privileged to participate in a blessing ceremony by the Buddhist monks, where white threads were woven throughout the group and individuals were blessed. A further flight took us to the ancient city of Luang Prabang and its historical temples, where the local guide was able to add a particularly personal view as he had spent many years there as a monk. 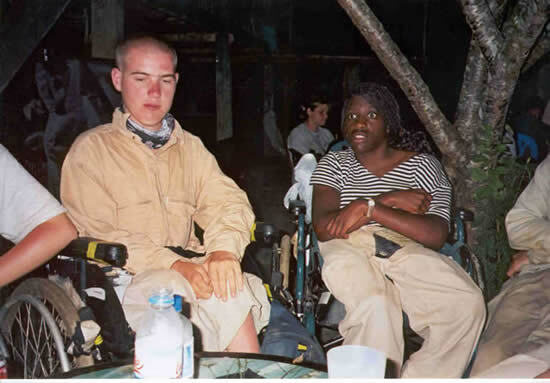 The much recommended climb to the top of Mount Phussi became a personal challenge of enormous proportions for one group member who, despite being wheelchair bound, wanted to climb down the steps without help. This was achieved with much support from the rest of the group and was a huge inspiration to many. Another boat trip took the group past the Pak Ou Caves and to an amazing night’s stay at an isolated lodge on the edge of the mighty Mekong River before crossing back into Thailand and starting the journey back to Bangkok. Chang Mai, the capital of fake replicas, was a shopper’s paradise. 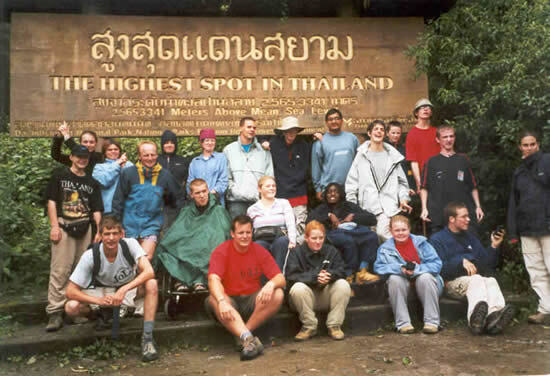 Our final train journey brought the group back to Bangkok for a final visit to the temples and a trip to the River Kwai to visit the famous bridge and the war museum. Each youngster was touched or changed in some way by the journey. Few were unmoved by the scenes from the genocide museum in Cambodia or the trip to the rubbish dump. Others chose to remember the beauty of the temples and the mountains or the excitement of the helicopter trip. 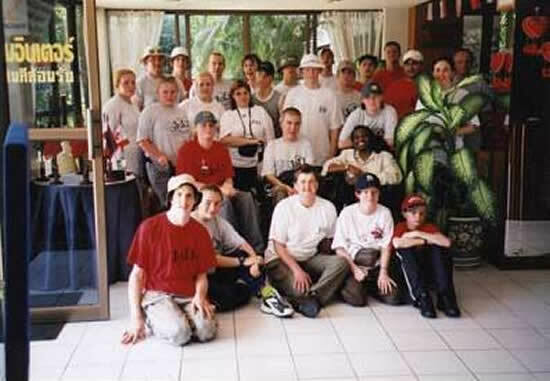 There were many personal achievements as well as those completed as a group. Every individual returned home with their own memories, experiences and feelings, and those will last forever, regardless of future challenges. The expedition would not have succeeded without the effort and hard work of the individuals who took part. As a group they achieved and surpassed every challenge put to them. As individuals they returned with the knowledge that nothing is impossible. The success of each journey owes much to the teamwork, courage, good humour and personalities of the teenagers and leaders who participate. To every single member of the team who contributed so much and who benefited so much from the expedition, life will never be quite the same again. Problems will not vanish but we hope that each participant will feel better able to cope with the problems that life throws at them; better able to take control of their own lives and destinies, and better able to look positively and creatively towards the future. JoLt blood now flows in their veins and, we are sure, they will be more determined and more confident of their own ability to find solutions to problems and to achieve their hopes and dreams. We hope that they will continue to turn to us in times of trouble and in times of success. We are indebted to Her Majesty Queen Noor of Jordan for continuing as our President and to the help of friends old and new, companies and charitable trusts without whom the 2002 Journey of a Lifetime would never have been possible. We are greatly indebted to all the people who worked so hard both in Britain and in Indochina to ensure that this was truly a “Journey of a Lifetime”. We thank you for your friendship and support but most of all we thank you for caring. Participants: Paul Barker, Rachael Belfield, Carl Birkin, Gemma Guest, Kevin Buckley, Nathan Dallenger, Sarah Fencott, Zara Fisher, Karen Guile, Christopher Holland, Samuel Jervis, Cheryl Johnson, Peter Keeley, Liam McNeice, Samuel Mildon, Charmaine Riley, Karl Rumsey, Alice Taylor, Atif Umer, Rachel Wharton. Leaders: Stuart Berkeley, Alan Buzza, Dorothy Dalton, Christopher Dodds, Shirley Farthing, Claire Isham, Nick Veevers, Bill Young.